Each whitening kit includes a total of 14 pack, 14 uppers and 14 bottoms. The whitening strips have been specifically designed to contour to the surface of your teeth for maximum whitening. Stay active and go on with your day while whitening – 30 minute session per day. Professional teeth whitening in the convenience of your own home. 1- Keep the strips in a cool place. 2- Never handle them with wet hands. 3- Try to wipe your teeth with a napkin and dry your teeth before applying. 4- Do NOT use the strips immediately after brushing your teeth. It is better not to brush your teeth before whitening but you need to floss and rinse your teeth very good before whitening. You can brush lightly after whitening. 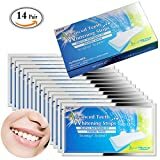 Advanced teeth whitening strips are very easy to use. You can whiten your teeth in just 2 weeks.Step 1: Fit lower strip – apply gel side against your teeth and fold over the remainder to back of teeth. Step 2: Fit the upper strip. Step 3: Dispose the strips after 30 minutes (minimum 15 minutes). Clean your mouth carefully and clean the gel off your teeth. Store the strips in a cool/cold place. Refrigerate but do not freeze the strips. Keep them away from direct heat sources. Removes years of teeth stains in just 1 hour for a noticeably whiter smile. Whitens teeth faster than ever, even when there is no time to plan. Advanced Seal Technology, no slip grip stays put so you can talk and drink water while whitening teeth. Uses the same enamel-safe teeth whitening ingredients dentists use. A comfortable, no-hassle home teeth whitening experience. Fast Teeth Whitening: The next step in your beauty routine. Get a noticeably whiter smile for that last-minute event with 1 Hour Express Whitestrips, now faster than ever. Unlike brushing alone, 1 Hour Express goes beneath the enamel surface to remove years of stains faster than ever. Enamel safe, 1 Hour Express Whitestrips will reveal same-day results for a brighter, whiter smile that shows. Breakthrough formula offers whiter teeth in 3 days (for best results, use as directed for 4 weeks) just by brushing. Contains 2x the whitening ingredient (Vs Optic White Sparkling Mint). 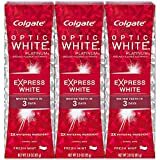 Colgate Optic White PLATINUM Express White Toothpaste is a revolutionary product in the Optic White collection. 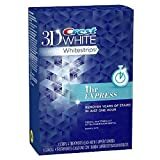 This breakthrough formula gives users whiter teeth in just three days just by brushing (for best results, use as directed for 4 weeks) . The toothpaste contains 2x more of the whitening ingredient, Hydrogen Peroxide (Vs Optic White Sparkling Mint). Having a radiant and polished look is quick and easy with Colgate Optic White PLATINUM Express White.